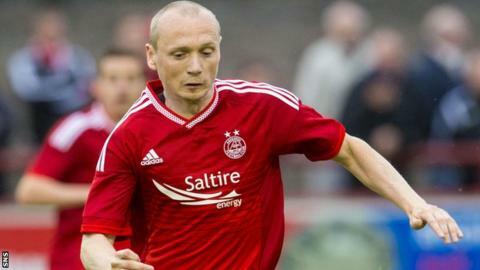 Aberdeen midfielder Willo Flood believes Scottish football would benefit from standardising its artificial pitches. Aberdeen are in action on Hamilton Academical's synthetic New Douglas Park surface on Sunday. "Every astroturf pitch in Scotland is different," said Flood, who returned from injury two weeks ago. "If it got to the stage where they were the same, I think it would be better for the whole of Scottish football." Flood echoed the comments of his manager Derek McInnes, who highlighted the transient nature of artificial pitches. "All astroturf pitches are different, and that's the difficulty at times," he said. "Sometimes it can change within minutes, depending on the weather as well. "You can have a really wet, slick surface, and all of a sudden it dries out. It is different from grass in a lot of aspects but we're just going to have to adjust to it - we won't win, draw or lose the game because of the pitch, it'll be through our performance. "I think we've got to make sure we don't have any hang-up on it. We know it's an astroturf pitch, we've shown we can get results on that pitch and other astroturf pitches in the last couple of seasons. "For me, it is not an issue at all. We have to just deal with the circumstance, deal with the opponent and come through." Aberdeen endured contrasting fortunes at Accies last season, losing 3-0 in October 2014, but triumphing by the same scoreline four months later. "I think Hamilton are a team who, if given encouragement, can rattle you, can get in about you, can make the game quick," added McInnes. "The pitch lends itself to making the game quicker anyway; it can be quite frantic at times. "You've got to be able to make sure you see that part of the game out and know that when the game does settle, if you can bring composure and a balance to it, there are pivotal times to show quality. "By and large you've got to make sure you fight your corner and do the dirty stuff."